Special Reports - The Top 1 Percent: How Much Do They Earn? To make the top 1 percent, a household must have AGI of $343,927 or more. The top 1 percent contributed about 37 percent of the taxes paid in 2009. Roughly 44 percent of New York City residents made the top 1 percent in 2007. It's usually considered impolite to ask how much money someone makes, but that question is at the forefront of the Occupy Wall Street movement. Protesters announce they are among the 99 percent of income earners who aren't getting the financial and tax benefits the top 1 percent receives. So just how much do you have to earn to be part of the elite 1 percent? Based on 2009 tax year filing data, the Internal Revenue Service says an adjusted gross income, or AGI, of $343,927 or more will put you in the top 1 percent of taxpayers. 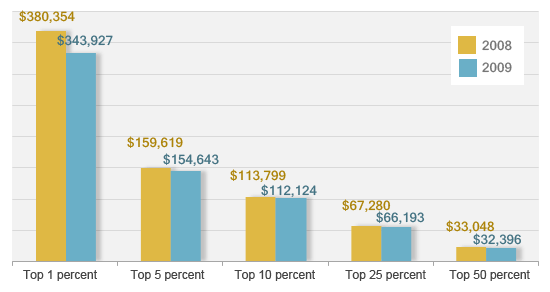 How much must you make to be in the top 50 percent of U.S. earners? That means a single filer who made $343,927 or more in 2009 is in the top 1 percentile. A married couple with two kids and combined earnings of $343,927 or more also was among the top earners in the country. The 2009 figures are the latest the IRS has tallied. Filing of returns for tax year 2010 didn't officially close until Oct. 17. The 1.4 million Americans in the IRS' top taxpayer category in 2009 reported nearly 17 percent of all the country's taxable income. From those filers, the IRS collected $318 billion or almost 37 percent of all the individual taxes paid in 2009. Where the top isn't that much: For most Americans, making more than $340,000 a year does feel rich. But for residents of high-cost areas, such as much of California, New York or major urban areas, that amount, especially for dual-income families, is not that unusual. In New York City, where the Occupy Wall Street movement began, the richest 1 percent of households saw their share of all income in the city rise from 12 percent in 1980 to 44 percent in 2007, the last year for which data are available, according to a study by the Fiscal Policy Institute. Those professions are among the most represented occupations of taxpayers in the top 1 percent of earners between 1979 and 2005, according to a November 2010 academic study of "Jobs and Income Growth of Top Earners and the Causes of Changing Income Inequality." Other studies, higher incomes: Some other tax calculations require higher incomes before a person can be classified as part of the top 1 percent of earners. The Tax Policy Center in Washington, D.C., a joint venture of the Urban Institute and Brookings Institution, runs an economic simulation model that shows the top 1 percent of earners in 2009 made $503,086. TPC projects $516,633 as the cutoff for the top earners in 2010 and $532,613 for 2011. Roberton Williams, senior fellow at the Urban-Brookings Tax Policy Center, says his group's income figures are larger because it "takes a much broader, more comprehensive look at income. We look at income regardless of the source, not just adjusted gross income." U.S. Census data show that from 2000 to 2010, median income in the U.S. declined 7 percent. And the outlook for recouping lost earnings isn't good, according to a recent Wall Street Journal survey of economists. The economists told the newspaper they expect inflation-adjusted incomes to rise only 5 percent over the next decade. "The State of Working America's Wealth," a study by the Economic Policy Institute, or EPI, produced similar bleak income results, especially for lower-income earners. The Washington, D.C.-based think tank found that from 2007 to 2009, average annualized household wealth declined by 16 percent for the richest fifth of Americans and 25 percent for the rest of the country. But even with the across-the-board income drops, EPI researchers found that in 2009 the wealthiest 1 percent of U.S. households had net worth that was 225 times greater than the typical median household's net worth. And that information might just prompt the Occupy Wall Street participants to add 225 to their 1 percent numerical complaint list.